The scent of barbecue brings a flood of memories rushing back to me… memories of family and friends, some now departed, and the fun we had at my great uncle’s cattle ranch in the rolling hills of San Luis Obispo, CA. I have farmers on both sides of my family, and my childhood was full of Santa Maria-style barbecue cookouts. Uncle Dennis and his friends would stand over a huge iron oak-filled fire pit, slowly smoking the meat till it was tender and perfectly done. Aunt Pauline would make vats of ranch beans and salad. She’d spread French bread with copious amounts of garlic butter. Just before the meal, Uncle Dennis would throw the bread onto the fire pit till it soaked up the smoky oak flavor and grill marks were seared in. With the scent of garlic bread and barbecue in the air, we’d dig into the feast. I miss those sunny afternoons. I miss sitting with my family and chatting about this, that and the other thing. I miss my Aunt Pauline and her sister, my Grandma Carolyn. What a blessing to grow up in a small town, surrounded by a loving family. Simple pleasures. Now that I live in the hustle and bustle of Los Angeles, I appreciate it all the more. While I grew up adoring those barbecue cookouts, my diet has changed quite a bit over the years. Now I eat flexitarian style, meaning the majority of my nutrition comes from vegetables, fruits, whole grains and legumes. That said, once in a while my family craves meat. Every month or two we indulge in some organic steak or brisket. 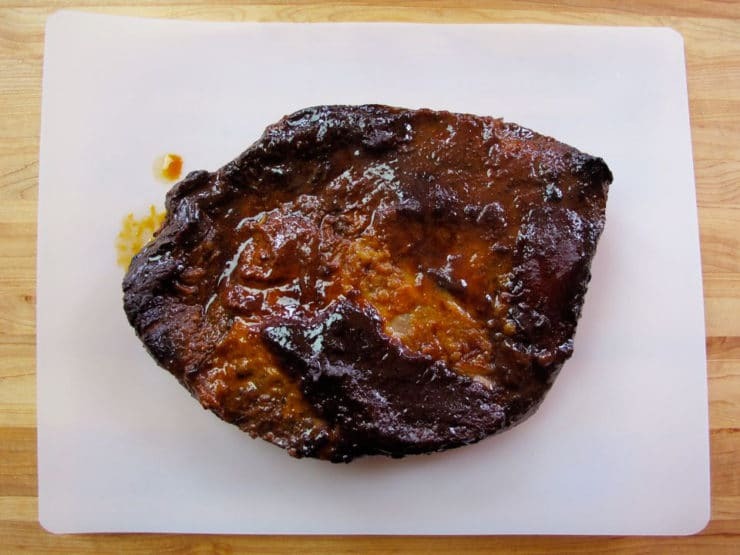 Sadly I don’t have a giant iron oak-filled fire pit in my back yard, so this has become one of my go-to recipes for preparing barbecue-style beef brisket. The slow cooker keeps the meat from drying out, and it requires very little effort… just set it up in the morning and let it slowly cook all day long. The meat cooks up meltingly tender. The longer you cook it, the more it takes on the consistency of tender chipped beef, which I love. The idea originally came from a friend who recommended that I slow cook a brisket smothered in barbecue sauce. Over time, I’ve added some seasonings to the method to enhance the flavor. This recipe has been perfected over time; it was one of the first recipes I ever posted on my blog, but I am resharing it today because the modifications take it from good to awesome. It couldn’t be easier. Stick it in the slow cooker in the morning, and by the time you get home you’ll be minutes away from a hearty and satisfying meal. Serve with mashed potatoes or a baked potato and a salad on the side. You can also pile the beef onto hamburger buns and make barbecue beef sandwiches. This brisket will fill your home with the scent of barbecue, so be prepared. I actually love the smell… it reminds me of afternoon cookouts, my small town childhood and the love of my family. I hope you enjoy it as much as we do. Note: this recipe is gluten free if you use a certified GF honey barbecue sauce. Recipe for tender honey barbecue brisket in a slow cooker with sauce and spices. 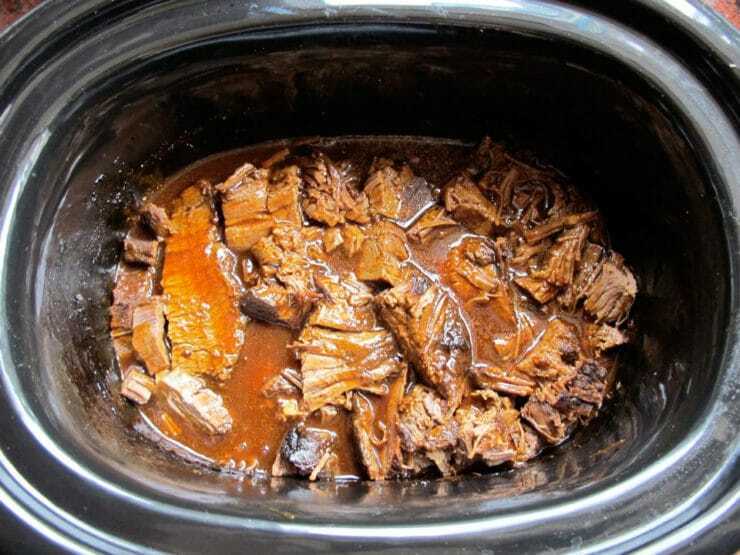 Easy crock pot brisket recipe for holidays or any day. Kosher. Sprinkle brisket with salt and pepper. Mix the onion powder, garlic powder, smoked paprika, cumin, and cayenne pepper together in a small bowl. Dry rub both sides of the brisket with the seasoning mixture. 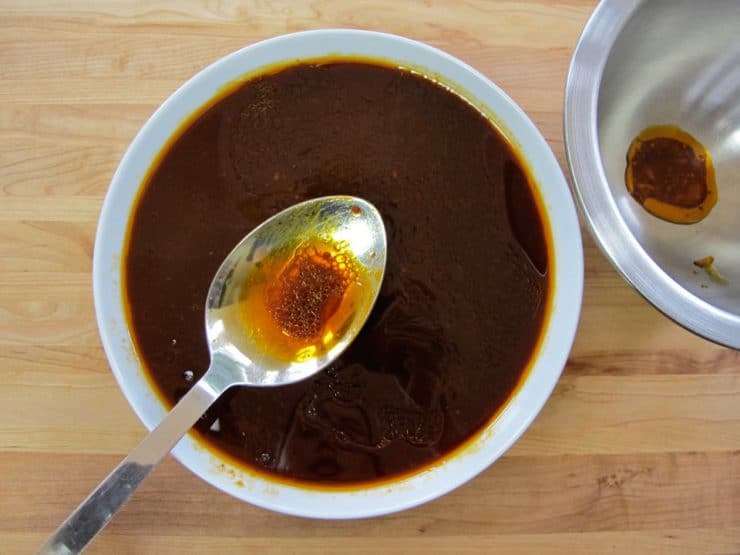 Stir together the honey barbecue sauce and brown sugar. Pour half of the sauce into the bottom of your slow cooker. Place the seasoned brisket, fatty side up, into the slow cooker. Don't worry if it's a little big for the cooker, the brisket will shrink as it cooks. Cover the top o the brisket with the remaining sauce. Cover the slow cooker and set heat to low for 9 hours, or until fork tender. Flip the brisket over so the leaner side faces upward. You'll be able to see the direction of the meat grain better on this side. Slice the brisket against the grain, at a slight diagonal, creating thin slices of meat. 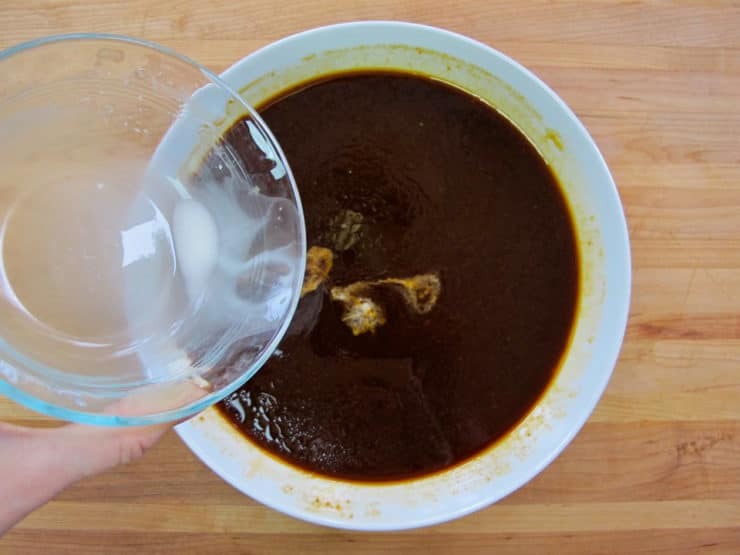 Skim the fat that has risen to the top of the sauce in the large bowl. It will appear lighter in color than the sauce, like droplets of oil on the surface. Skim as much fat as you can. In a small bowl, stir together cornstarch and 1 tbsp of water till completely smooth. Pour the cornstarch mixture into the bowl of sauce and stir to combine. Turn slow cooker to high for about 1 hour, till the meat and sauce are heated through and the sauce begins to bubble and thicken. Keep on warm setting till ready to serve. Note: the longer you cook this brisket, the more it will take on the texture of shredded or "chipped" beef. If you'd like for the meat to retain its sliced shape, no need to return the meat to the slow cooker. You can reduce the sauce quickly in a saucepan on the stovetop, then pour it over the slices in a casserole dish before serving. The leftovers make great BBQ beef sandwiches. Hi- can this be frozen once made? If so, how would you suggest reheating it? Thanks in advance! Hi Lisa, Tori’s assistant Ashley here. Yes, this can be frozen. I would suggest reheating in the slow cooker and adding more sauce if necessary. I am cooking this currently, but with only about 1.5 lbs of brisket. Any ideas as to how long to keep it in the slow cooker on low? Not sure, Kelley– best to check it after 4-5 hours, and every 30 minutes after, until fork tender. Wow! Tried this tonight for our Hanukkah meal and it was fabulous and SO easy! Everyone thought it was so delicious – great flavor! I actually didn’t do the last step with the cornstarch in the sauce, and while it was a little thin it was so tasty and poured like a thin gravy. Thank you! Not roast lol brisket half asleep and still trying to plan tomorrow’s dinner. Good Morning I’m going to try this recipe Sunday so stay tune, I will let you know,but it sounds like it’s going to be a big hit. Did you try this dish and how did it turn out for you? Please sign me up! Enjoy your website! I made it and it was soo yummy, easy, and tasted like it came off of a grill! I was surprised how great it was! The step by step made it very simple! Thanks! Delicious, a snap to prepare, and the leftover options are nearly endless! It was almost hard to sleep as the smell of simmering bbq filled our apartment. Brisket for breakfast? You bet! Thank you for this simple, easy to follow and fool-proof recipe. 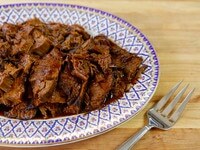 I just bought deckle brisket to make this for Rosh Hashana this year! I’m nervous though because the butcher didn’t have 5 lb piece of meat, so I bought two 2.5 lb packages. Do you think I can still put them together in the crockpot? I have a 6.5 quart crockpot, and I can’t imagine how all that meat is going to fit without it overlapping. Would it be ok to overlap and sit almost on top of each other if there was sauce in between? Thanks! Hi Leah! Don’t worry one bit, I’ve done this on many occasions. They will shrink up a lot as they cook, so some overlap is definitely ok. Not a problem at all! Hi Tori, I’m cooking for my boyfriend for the first time and found this recipe that seems like it’ll be sure to impress him. I hope! 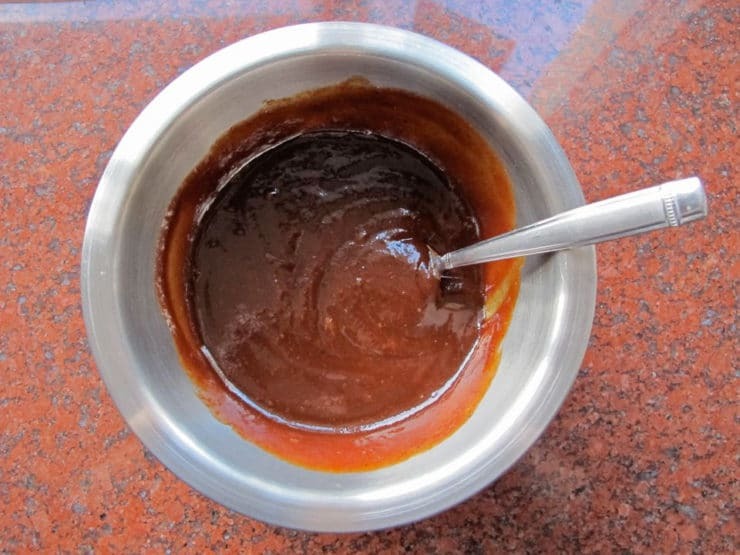 Do you have a particular BBQ sauce you’d recommend or even a recipe? My go-to sauce is usually sweet baby rays but you’re obviously the chef extraordinaire here so I could use your advice! Thank you! Sweet Baby Ray’s will work great Heidi! No need to make a homemade sauce, unless you want to make a special effort. I also like Bone Suckin’ Sauce. If you do decide to make your own, make sure it’s a sweet sauce with a touch of spice for best results. Made this for our family Memorial Day dinner and it came out perfect! Everyone loved it and raved about how good it was. It has already become a family favorite. Easy and yummy. Thank you sooo much! Awesome Betty, so happy to hear that! I made this yesterday. So very good. I cooked a 3 lb roast on high for 5 hours came out fantastic. This was absolutely delicious! Fun and easy to make. My husband tried one bite and said wow which makes me smile every time! My daughter loved it too. Do you have a particular brand of honey bbq sauce that you use? After it cooks, remove the meat from the pot. Use an immersion blender in the pot and blend up all of the onions into the sauce. You can pour the sauce over the meat and refrigerate them overnight together or keep the sauce separate and skim off the fat in the morning. I have been making this recipe for years now and I can’t wait to try yours! I LOVE this recipe as does my husband and 4 young kids! I have used different cuts of meat for this recipe and have never been disappointed. This brisket looks so delicious. It’s a recipe that I’ll definitely have to keep in mind for the upcoming summer. Yesterday I tried your honey apple challah and it was devoured by my family. Glad you put in the flexitarian bit because I wondered how you stayed in shape. Hope to see more flexitarian recipes and menus this year! I came across your recipe and can’t wait to try it. We love Santa Maria BBQ and haven’t had it since we moved in 2008. 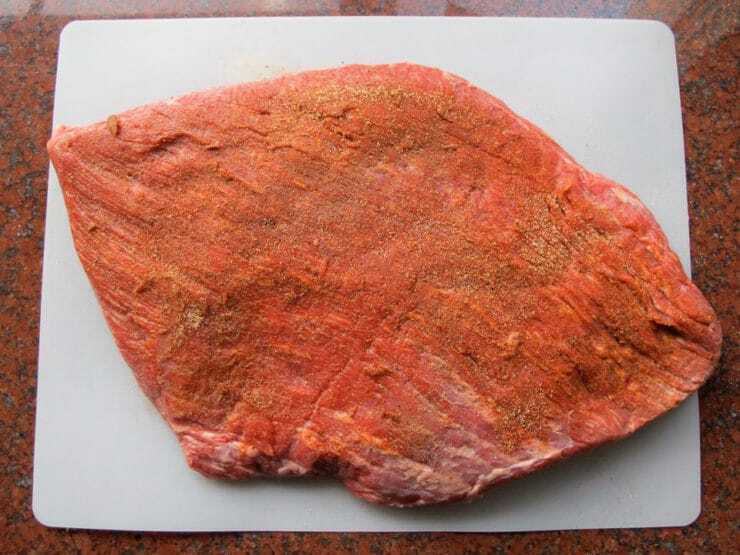 This will be my first brisket … wish me luck. Thanks for the great recipe. Ive been making a similar recipe without the sauce and just using a dry rub that is simply dry mustard, paprika, onion powder and garlic powder with NO liquid. Until I tried this I thought the former was the best brisket. This wins hands down. I cooked a 6lb brisket a week ago and had a party platter for 20+ of pastrami, corned beef, whitefish, bagels etc etc. The brisket was gone before my wife got a chance to even taste it. I even used an fairly inexpensive BJ’s brisket that had quite a bit of fat. Cooking a smaller one right now using first cut brisket and we’re not sharing this one. BTW, if you live near Oneonta NY you should try Brooks Barbecue Sauce right out of the bottle. Hi Tori, I have a 6lb brisket in the crockpot as I type this note, but I’m nervous because the meat doesn’t entirely fit in the slowcooker. So, I cut it halfway and shove both big slices in the crockpot. Is that okay? Will they shrink? I’m afraid that the whole thing won’t cook. Hi Nikki, the brisket will shrink as it cooks. 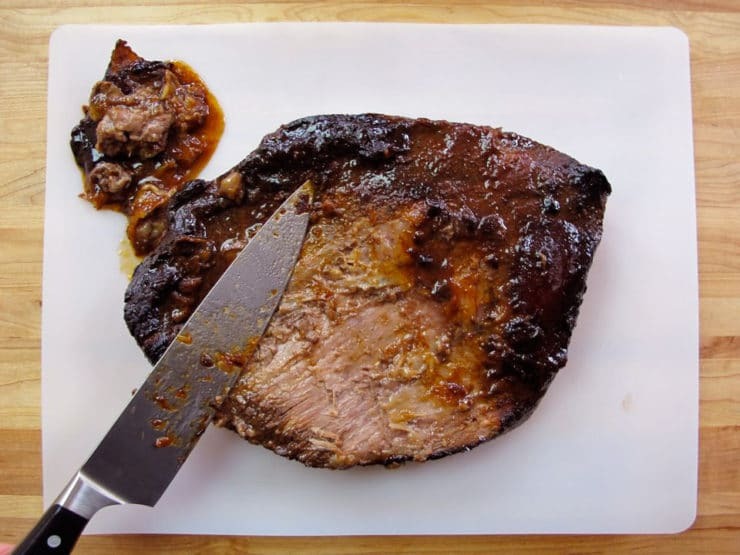 Did you add a little more sauce (your brisket is a pound bigger than the recipe says)? I’d add 1/3 cup more sauce. Then check it after four hours, it should be shrinking up and fitting better. By the way I have 7 pounds of brisket in my very large slow cooker right this minute, making the same recipe you are! This was so fantastic! I made 6.5 lbs of brisket for 10 adults and not a trace of meat was left! So delicious! I may never make brisket in the oven again! Made this today and it was soooo easy and delicious! I have been searching for a a recipe like this. Spent all of Saturday making one of Ina gartens recipes that got fabulous reviews and I would never make it again. Too much work little payoff. This recipe however motivates me to cook with a delicious result like this. There is nothing worse than spending the time and it doesn’t come out good. Can’t wait for leftovers tomorrow and am serving these sliders at my Hanukkah party. Yay! I just got 6.5 quart my slow cooker and want to do this brisket recipe just for three people. I bought a 3 pound first cut brisket. How much time would this need to cook for? Any other adjustments? Thanks for your input! Hi Enid, I have never made that small a brisket with this recipe. My suggestion is to check it around 6 hours and continue checking till the meat is tender enough to flake with a fork. Enjoy! I made this tonight using some home made bbq sauce instead of the honey store bought sauce and it was OMG delicious! Thank you for the recipe. This is a new family favorite! Great Catherine! So happy to hear that. Wow – when we got home after work our two German Sheppards had gotten up on the counter, flipped the top off the slow cooker had eaten the whole 4 1/2 lb. brisket. There was a huge mess all over the kitchen floor!!! Both dogs were licking their chops and paws and didn’t show slightest amount of guilt. It was so funny we couldn’t get mad at them. Locking the doggy door next time ! LOL well I can’t really blame them Chandon! It’s so delicious, how can they resist? Thanks for the laugh! Is there any benefit to seasoning the meat overnight? Hi Jesse– it couldn’t hurt, but this meat is super flavorful as-is, so no need to unless you want to take that extra step. Enjoy! Hi Tori, I like your website. I made this and the flavor was great, but it was very stringy. What do you think happened? Hi Carolyn– first off, when you slice the brisket, you want to make sure you do so against the natural grain of the meat. If you cut with the grain, you’ll end up with a lot of stringiness. Also you may want to cook it for slightly less time next time– it may have been overcooked a bit (different slow cookers cook at different temperatures), which can lead to stringiness. Tori, I don’t think that the corned beef is in a brine and is not seasoned. Hi Jenny, as far as I know all corned beef has been salt-cured even if it is not in a brine when you buy it. The salty flavor of the corned beef may clash with the sauce– but I really can’t say for certain because I haven’t tried it myself. If you do try it, let us know how it turns out! Well Tori you were correct! The corned beef seasoning did not work well with the sauce at all. So now I will only use brisket as it is such a stellar recipe. Hope you enjoyed the chaggim! You too Jenny! Sorry the corned beef didn’t work out. Glad you’re enjoying the recipe! Oh, and wouldn’t you know, one of our guests commented that the brisket seemed much like her own- and we discovered she’s a TheShiksa junkie too! Wishing you a fantastic, healthy, sweet new year! Batya, this comment made my whole weekend. So happy your holiday meal turned out great! Happy new year to you as well! I’ve made this before and it’s fabulous! Do you think that I could make this with corned beef as I have one in my freezer? Hi Jenny– you know, I’ve never tried it myself, but I don’t think corned beef would work well here. Something about the saltiness of the corned beef and the spices might clash with the barbecue brisket… I think it all might be a little “too much.” Know what I mean? I could be wrong though. This is great! I’ve got it back in the slow cooker now. I used a sweet and spicy bbq sauce for a kick and added dried cranberries for some fruity goodness. I’d like to try this for Rosh Hoshana and thought about setting up the slow cooker to do its thing overnight. What about reheating several hours later that day? Any advice? I’m thinking of pairing it with saffron rice (because the BBQ sauce will already have sweetness) along with carrots roasted in the oven with olive oil and garlic. And challah, of course, with raisins. I hope to try this tonight sounds like a easy recipe! Sounds great except I am from South Africa and do not get Honey Barbeque sauce here. Can someone give me an alternative recipe for the sauce. I only have 6-7 hours to cook this, will I ruin it if I cook it on high? I always cook this on low because brisket should really be cooked low and slow for best results. Technically it can be cooked on high, but the meat will not turn out as tender. If you try it let me know how it works for you. NO!!! Don’t ever cook a brisket on high!! Fast and high heat cannot break down the muscle as well as low and slow cooking. You will never get as tender as when you use low and slow. Trust me, I ran a BBQ joint for 3 years…low and slow is the way to go. Just made this – it is absolutely delicious!! As a rule, ranch beans are pintos. Guess Santa Maria is an exception. Given ranch beans are a general category, we just should let people know about pinkitos, special for Santa Maria. How can you talk about Santa Maria BBQ and leave out the biggest side dish? Pinkito beans… Not ranch style. For shame! I just made this brisket, abousolutely delicious. Definitely a keeper! Fabulous Brenda! So pleased you liked it. It was fabulouse. I added a smattering of ginger and a bit more cayenne. I just tried this for our Memorial Day dinner. Wowie! It was incredible. I don’t have a slow cooker so I put the 4 lb brisket in the oven at 325 for four hours in my Creuset dutch oven. Turned out perfectly, didn’t have to worry about moisture at all. Thanks for another wonderful recipe. Fabulous Annette! Thanks for reporting back. I do love this recipe, it’s a perfect choice for Memorial Day. Brisket was fantastic! Cooked it the day before, refrigerated it and removed the fat. Then made some extra Honey BBQ sauce and had it on the keep warm function on crockpot from Friday evening till it was served Saturday lunch. Served it with Kaiser rolls I’d made and it was a hit! THANKS! That looks D-lish! We are beef eaters so I’ll definitely be trying this recipe. 6-8, but if you’re serving it on hamburger buns it will stretch a lot further. 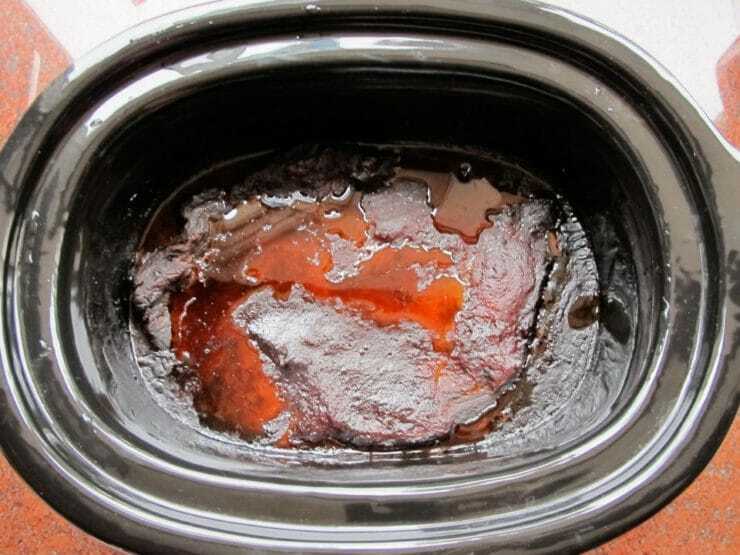 do you use “liners” in the crock pot when you cook? Hi Tammy– no, I try to avoid heating plastic around my food as much as possible. How would you adapt this recipe for Shabbat lunch if it was started on the Friday before sundown? It would be great to serve the bbq brisket on challah rolls! Hi Jenny, I’ve never done it that way before, but it will probably be ok if you have it on the “warm” setting after the initial 9 hour cook period. Make sure you get a fattier cut of brisket (don’t trim it too much), and I would check it periodically to make sure it’s not getting dry or over-cooked. Try to put it in the cooker as late as possible on Friday before sundown, and if it starts looking dry or overcooked add some water to the cooker. Different slow cookers have different heat settings, and some warm settings will be hotter than others, which is why I suggest keeping an eye on it. In my cooker it would be fine, but your cooker might have a hotter warm setting. Enjoy! Just when I thought it was time to pack up the slow cooker, you publish this great recipe. I see bbq beef sandwiches in my family’s future. I love both your blogs especially the recent one on Hearst Castle! I love the Central Coast, too. Hi Joyce! Yes, you don’t want to trim all the fat on the brisket, it helps to keep the brisket moist and tender when cooking. First cut brisket is already trimmed, so I don’t trim any of the fat. You can take off most of the fat after cooking, as illustrated in the step-by-step pictures. Next time, leave the fat and trim it after the cooking process, you’ll have a much better result! I meant deckle – hate self correct! Hi Jen! Deckle will work, but it will produce a LOT of excess fat while it cooks, which means you’ll have to skim quite a bit from the sauce. I’ve never tried it with a roast, but I don’t see why it wouldn’t work as long as it’s covered in sauce. Keep an eye to make sure it doesn’t dry out. 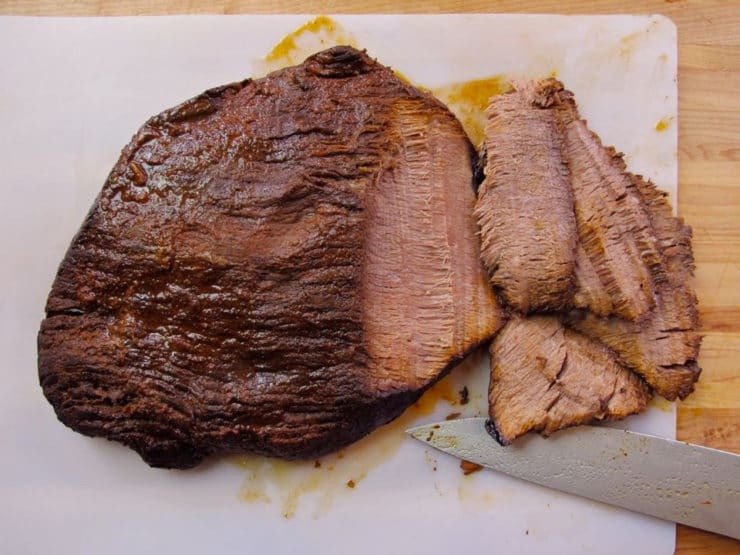 Don’t fear the brisket cut here, as the recipe is really written for brisket and it will produce an awesome, tender result every time. Enjoy! Would this work with other cuts of meat as well? Maybe feckless or roast? Now I have a reason to go by a slow cooker. Not something my Mom used. Thanks can’t wait to make. Could u cook some veggies in the pot with the meat? Don’t EVER quick cook brisket in the oven. Brisket is a tough, fatty cut and must be slow cooked to saturate the meat with emulsified fat and juices from the cut. The minimum amount of time for an oven roast is 6 hours at 250-275. For the best, most tender brisket ever go 8-10 hours (great to do overnight) @ 225-250. Use a 5-7 lb brisket and dry rub it with whatever rub you prefer. Then, place it fat pad side up in a shallow roasting pan and cover with foil. 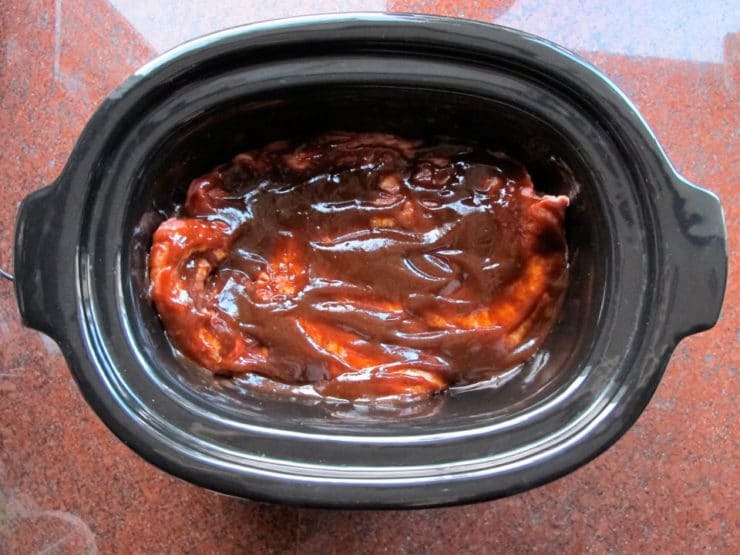 I guarantee you will never want it any other way after that, though this crockpot recipe gives it a run for the money. I don’t have a slow cooker and don’t want to buy one. Can I bake in the oven at about 325F for 3 hours or so? Hi Glenda– I’ve never made this particular brisket in the oven, but it will probably work. However, you will need to cook low and slow to produce tender results (all brisket should be cooked low and slow). I would cook it at 300 degrees for 5-7 hours. It will take about 1 hour per pound of meat. 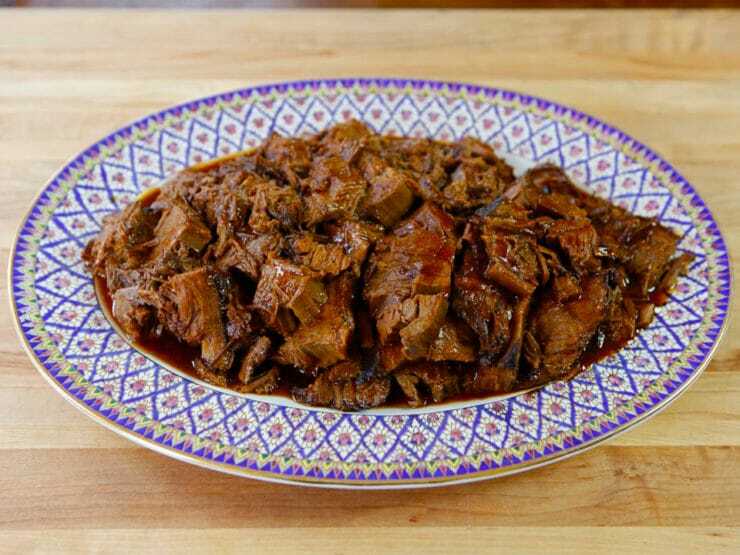 Brisket is ready when it flakes tenderly when pierced with a fork. You can let it cook even longer for a soft, shredded texture. The only thing I would be concerned about is the amount of liquid… slow cookers tend to keep things more moist than the dry heat of an oven. I would check it every hour or so to make sure it’s not looking too dry. If it does, add water to the pan to keep it from drying out. Use a first cut brisket, not super lean, so there is enough fat to keep things moist. At the end of cooking, strain the fat and reduce the sauce on the stove with cornstarch. Good luck! Use one of those oven roasting bags to cook the brisket in if you don’t have a slow cooker. Works like a charm! I just love this dish Tori. This would go over so well in my household. I love brisket, but the traditionalist in me thinks its a shanda to ruin it with anything other than onions, broth and spices (paprika and pepper). Sweet brisket…hmm… I’m not sold. Give it a try Amy, I know you will love it! Wow. I’ve never even considered doing biscuit in a crock pot, I’ve always used a smoker. I’ll have to give that a shot. Looks perfect. The meat is so tender that it just falls apart. I’m thinking this would make great “game day” sammies! I do not eat meat, but……. you made me be in tentation! Barbecue brisket is a favorite, not to mention the amazing smells it creates in the house while making it. This is a sure recipe to knock the socks off everyone. I made this for my husband tonight and he loved it. I am a vegetarian so I will have to take his word. And he better like it bc he has to eat it a few more times! I made my own BBQ sauce from the neelys recipe and added honey. I didn’t even taste the sauce preheat bc the sauce contains worcestershire sauce. So I have to totally rely on my family’s critique. Thank you! Thank you, Tori, for posting this information. It is informative and interesting and important, and the recipes look delicious. I look forward to preparing some of your dishes for my family this holiday season, and your blog has become an enormous resource for me. Keep up the good work! Thank you for this delicious and easy recipe! It was great to just put everything into the crock pot and have an delicious home cooked meal when we got home. I used a chipotle pepper bbq sauce and added additional chipotle pepper flakes to give it a kick.